The community is invited to join Cabarrus County employees to make the holidays merrier for some local families and individuals. Cabarrus Helping Hearts and Hands (Ch3) -- a County employee-run charitable organization -- is collaborating with the community to provide gifts for children, individuals in group homes, senior citizens, veterans and others served by the County and its partner organizations. The Ch3 Wendy Gainey Memorial Christmas Tree is similar to an “angel tree” and contains tags with gift lists for children and adults. Participants can select a tag and return unwrapped presents to the spot where they picked the tag no later than Dec. 7. 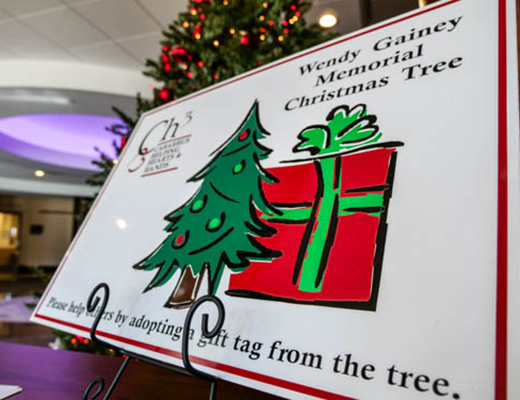 Formerly called the Ch3 Helping Hands Tree, the program was renamed in 2011 to honor the memory of Wendy Gainey, a longtime County employee who was passionate about giving back to the community. The collection drive is now in its 14th year.